A wintertime walk in San Antonio, Texas. The vibrancy and human scale of Venice can be found in Texas, of all places. This river was formerly an ugly, polluted, littered concrete quagmire running through the heart of the city. But some visionaries succeeded in building a pedestrian riverwalk along it, and now the river is cleaned up, and the walk is so internationally famous that the tourist traffic is heavy. As a result, the walk was quickly lined with shops and restaurants that make the walk rather vibrant. We were there for a conference just before the holiday, and at night the river is decked out with candles (luminaries), decorations, and lights. Boatmen, serving as taxi drivers, often ply the river with long Italian-style paddles. Very romantic. The City has been, during its history, under the flags of France, Spain, Mexico, the Republic of Texas, Confederate States of America, and the U.S. 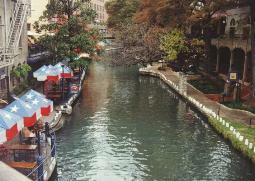 The Alamo was founded in 1718 near the tree-lined San Antonio River, and is in the center of downtown. Here, in 1836, Davy Crockett, Colonel James Bowie, Colonel William B. Travis and 186 other Texans stood off General Antonio Lopez de Santa Anna, dictator president of Mexico and hiss 5,000 troops. Every defender died in the battle. In the 1840s, there was a heavy influx of Germans. Today, San Antonio is a prosperous city. In 1990, 935,933 people lived in the city. As such, it is the third most populous city in the state. It is one of the most historic communities in the U.S. Three colonial cities were combined in 1793, and the current city was established in 1809. Four old Spanish missions have been preserved at the San Antonio Missions and National Historical Park. Texas independence day is celebrated each year at the Alamo on March 2nd. The city is sometimes called "The Venice of the Prairie."